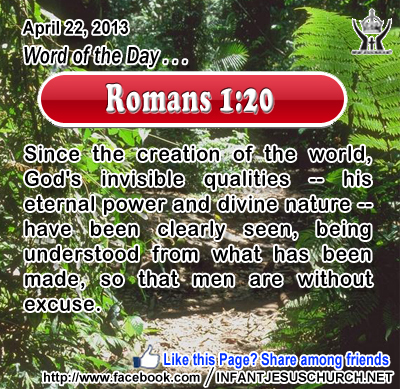 Romans 1:20: Since the creation of the world, God's invisible qualities -- his eternal power and divine nature -- have been clearly seen, being understood from what has been made, so that men are without excuse. Heavenly Father, thank you for your creation. Thank you for its beauty and variety. Thank you for the changing seasons and the beauty of Spring. But most of all, thank you for choosing to show yourself to us, your creatures. In Infant Jesus' name. Amen. 1"Truly, truly, I say to you, he who does not enter the sheepfold by the door but climbs in by another way, that man is a thief and a robber; 2 but he who enters by the door is the shepherd of the sheep. 3 To him the gatekeeper opens; the sheep hear his voice, and he calls his own sheep by name and leads them out. 4 When he has brought out all his own, he goes before them, and the sheep follow him, for they know his voice. 5 A stranger they will not follow, but they will flee from him, for they do not know the voice of strangers." 6 This figure Jesus used with them, but they did not understand what he was saying to them. 7 So Jesus again said to them, "Truly, truly, I say to you, I am the door of the sheep. 8 All who came before me are thieves and robbers; but the sheep did not heed them. 9 I am the door; if any one enters by me, he will be saved, and will go in and out and find pasture. 10 The thief comes only to steal and kill and destroy; I came that they may have life, and have it abundantly. What can shepherding teach us about God and our connection with him? At the end of each day the shepherd brought his sheep into shelter. They knew the voice of their shepherd and came at his beckoning. So familiar was the shepherd and his sheep, that each was called by a separate name. In the winter the sheep were frequently brought to a communal village shelter which was locked and kept secure by a guard. In the summer months the sheep were usually kept out in the fields and then get together into a fold at night which was guarded by a shepherd throughout the night. He was literally the door through which the sheep had to pass. The scriptures describe God as a shepherd who brings security and peace to his people. The Lord will keep our going out and your coming in from this time forth and for evermore. Loving Infant Jesus, you always lead us in the way of true peace and safety. May we never doubt your care nor stray from your ways. Keep us safe in the shelter of your presence.